Readers of this blog know I have a particular interest in intercity rail in New England stemming from growing up in New Haven. So when Eitan Kensky sent me a February presentation I hadn’t previously seen from the Northern New England Intercity Rail Initiative (NNEIRI, not to be confused with the Northern New England Regional Rail Association, or NNEPRA, which runs the Downeaster), I was seriously intrigued. There have been numerous efforts over the years to revive the Inland Regional service that Amtrak and predecessors once ran between Boston, Worcester, Springfield, Hartford, and New Haven, and this document presents the general outline of the group’s current vision for the return of such service. Much of the research seems to have been done by contractors HDR, and the predominant vision is clearly that of MassDOT, with secondary input from Vermont and other stakeholders. Massachusetts has, of late, been focused on two major goals for non-Northeast Corridor intercity rail: a link to Montreal and restoration of Inland Regional service. The current study (logically) links these two together. Tough previous service to Montreal has run along the Central Vermont line, turning off the Boston & Albany at Palmer to serve Amherst before heading north through Vermont, the current vision has Boston-Montreal service using the recently rehabbed Connecticut River Line from Springfield to Greenfield before continuing north. It’s a little bit longer, but serves Springfield, Holyoke, Northampton, and Greenfield instead of just Amherst, and takes advantage of the state-owned Conn River trackage. The predominant challenge to intercity rail in New England is that the trackage is in most places exceptionally curvy. The build alternatives envisioned for the NNEIRI service thus focused on regular-speed trains, with no ambitious plans for even moderate-speed (110 mph) options. It’s important to remember that “maximum speed” here means Maximum Authorized Speed, or MAS, rather than average speed. On curvy legacy tracks the trains are unlikely to obtain the maximum speeds for very long stretches, given FRA restrictions on tilt for conventional equipment (although the 90 mph MAS alternative does make brief mention of the possibility of acquiring tilt equipment). A Boston-to-Springfield time of right around 2 hours would be extremely competitive with driving, which is about an hour and a half without traffic (yeah, right) and realistically usually at least a half-hour longer. It’s also about the same time as Peter Pan’s bus offerings, but a train would presumably offer a much higher level of comfort and reliability. Costs would fall in the billion to billion and a half range for the bottom two alternatives, which seems on the high end for relatively simple double-tracking work within an existing right-of-way; I assume most of the capital expenses would be on the Vermont sections, since the B&A right of way is built to accommodate at least two tracks. Eight trains per day would run through from New Haven to Boston, a kind of mini-Inland Regional service. These trains would function as extensions of the current New Haven-Springfield shuttle service. There would be one round-trip per day from Boston to Montreal, and another from New Haven to Montreal, while the Vermonter would continue as it currently operates, with an extension to Montreal. 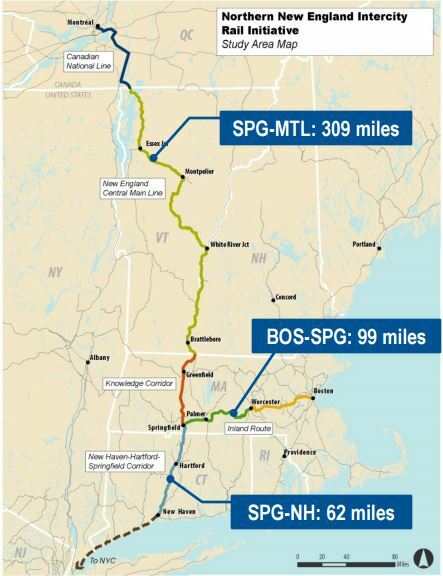 Springfield would get 9 round trips per day to Boston, and presumably the New Haven-Montreal train would have a timed connection with a westbound Boston-New Haven train at Springfield, giving Boston in effect two daily round trips to Montreal. All trains are envisioned to make all local stops, which is interesting to me; I would have run the Inland Regional/shuttles as expresses in Connecticut, stopping only at Hartford. As it is, the additional 9 corridor trips will provided important added frequency to the NHHS/Hartford Line service that should be beginning in 2016. A 2011 NHHS document envisions full cross-ticketing between NHHS and shuttle/Regional trains, and the boost from NHHS’ 25-32 trains per day at launch to 34-41 including the corridor services is nothing to sniff at. However, that many trains would clearly require Connecticut to finish double-tracking the Hartford Line between Hartford and Springfield. That task isn’t itself all that complex but has been deferred to Phase II of the NHHS project (though it is included in Governor Malloy’s 5-year transportation ramp-up plan) because of the considerable expense of rehabbing the Union Station viaduct in Hartford–which is, somewhat amazingly, believed to no longer be able to hold two trains at once–and the bridge over the Connecticut River. 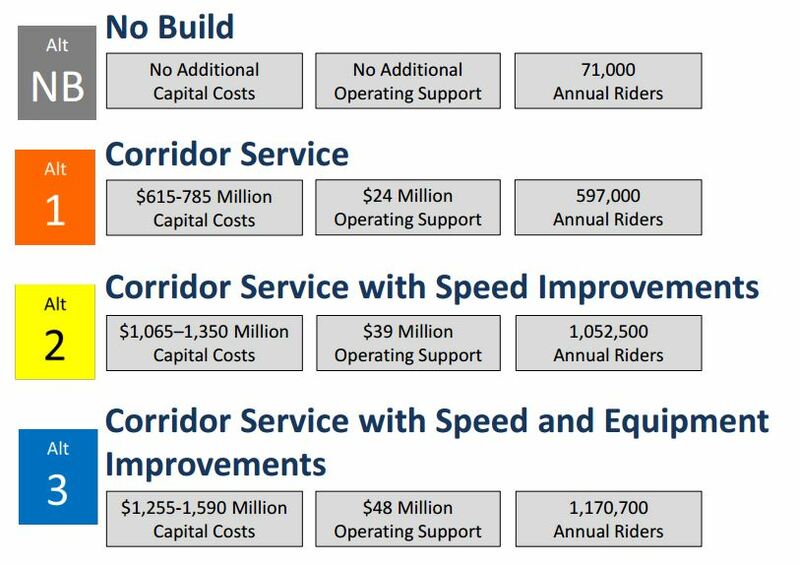 Interestingly, study staff clearly believe that Springfield-Boston service alone would be a poor use of resources, labeling it “Low Ridership” and “Ineffective and Costly.” As Alex Marshall pointed out on Twitter, much of the envisioned ridership to New Haven is surely people from Worcester or the Metro West region who want a two-seat ride into New York City without doubling back into Boston to catch an NEC train. Likewise, the study labeled plain Boston-Montreal service “Low Ridership,” while noting the potential for higher ridership in the New Haven-Montreal corridor. 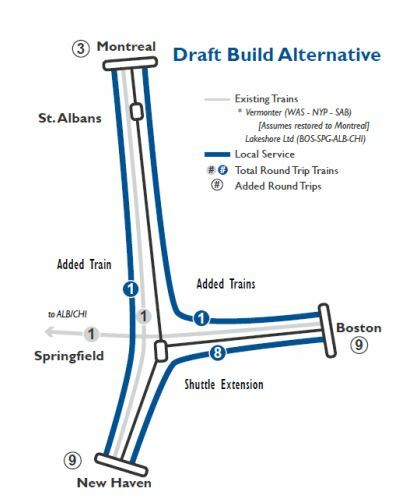 Despite decades of pleading for Montreal service, planners still seem to believe that Boston doesn’t quite deserve it. That’s not particularly surprising to me given how slow such service would be and how sparse population is along the corridors between the two cities. So for now, there will likely be just the one round trip per day, plus the possibility of a two-seat ride via transfer in Springfield, and that situation seems likely to stay the same for quite a while. As currently planned, the NNEIRI system looks like a sideways T, with the long axis pointing to Boston. I’m on record as a (self-interested) proponent of Albany-Boston service, and I think some of the improvements proposed here strengthen the case for finishing off a cross-shaped network with trains from Boston to Pittsfield and Albany. Double-tracking the Boston Line from Worcester to Springfield would leave less than 100 miles of single track from Springfield to Albany (it’s 102 track-miles, but there are existing sidings and stretches of multiple track). If trains can do Boston-Springfield in 2 hours, a time of 4 hours to Albany should be eminently achievable even without much in the way of speed improvements. With significant speed improvements (most of the line west of Springfield is limited to 40-50 mph, even though the trackage west of Pittsfield isn’t all that curvy or steep) a time in the 3:30 range–which my previous post identified as the time necessary to be competitive–should be achievable. That would open up the possibility of Boston-Toronto service via the Erie Canal corridor cities–a potential market for an overnight train? Double-tracking the line, however, offers enormous potential, jumping the capacity from an estimated 30 trains per day to 75. In other words, CSX could double current traffic–a situation no one sees as being around the corner in New England–and there would still be 15 slots per day for passenger traffic. More realistically, a fully double-tracked B&A could easily accommodate 40 freights, the 8 proposed Inland Regional trips, 6-8 trips to Albany, and the Lake Shore Limited–a total of under 60 trains per day west of Worcester. Of course, fully double-tracking the line requires the states of Massachusetts and New York to cooperate, and the Cuomo administration has shown little interest in efficient passenger rail. The table of travel times above envisions a trip time of 1:40 from Springfield to New Haven given all local stops. This seems somewhat pessimistic to me, as the current shuttles and Vermonter are scheduled for 1:20 to 1:30 over the same route; perhaps the longer time takes into account that a few stops will be added under the NHHS scheme, but those should be counterbalanced by improved track speeds; it’s not a big deal, but I’m somewhat confused. Who’s going to operate it? Most commentary I’ve seen has assumed that any extension of rail service from Boston to Springfield would be operated by the MBTA. Running the trains through to New Haven would seem to preclude that possibility. Amtrak would seem the most logical choice, but the northeast state haven’t been thrilled with it of late; Connecticut, for example has opened the NHHS service to a bid competition. The NNEIRI network is an extremely complex system, involving at least three states, plus the province of Quebec and federal authorities regulating border crossings, the private railroads owning the tracks, and various other stakeholders. So perhaps now is the time to revive my call for a unified Northeastern passenger rail authority.